This picture sums up everything I feel about Indiana and their homophobic laws. 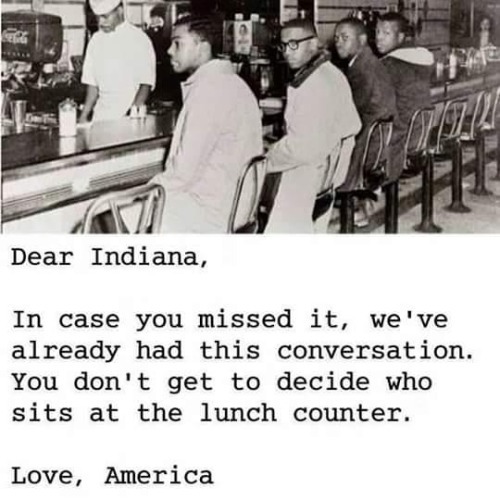 It’s no different than not allowing black people to sit and eat food. It’s discrimination and you can’t use your religion as a shield to hide behind. This is going to be tossed by the Supremes… and hopefully when that happens it will wipe out the other states that passed similar laws as dumb as this one. And let’s see how many apologists will try to say this is taken out of context as well. Let the whining begin in 3… 2… 1..